Concerned about your bank’s stability and your investments? Nearly all of us are concerned about how safe our investments are, particularly after recent news about the failure of IndyMac Bank. Business Librarian Roslyn Donald of the San Mateo Main Library recommends two free sources for bank ratings – Bankrate.com at www.bankrate.com , and Bauer Financial at www.bauerfinancial.com . Both of these sites offer a quick rating to assess a bank’s stability. Roslyn notes that if you want more than a quickie rating, and can read a balance sheet, check out the FDIC BankFind . “It provides complete financials, a historical profile and demographic information for all US banks. InvestorGuide – top financial news, currency rates, stocks, mutual funds, IPO’s, quotes and charts. American Association of Individual Investors – Education, tips and investment insights from the American Association of Individual Investors. Searchable. The BUBL information service is an internet link collection tailored for the library and higher education communities, administered by the Centre for Digital Library Research at the University of Strathclyde in Glasgow, Scotland. “BUBL” is short for “Bulletin Board for Libraries”. The site describes itself as offering “Free user-friendly access to selected internet resources covering all subject areas, with special focus on Library and Information Science”. The link is available through the Alameda County website at http://www.aclibrary.org/research/default.asp?topic=Research&cat=SearchtheWeb and scrolling down to the BUBL-link icon near the bottom of the page. It can also be accessed directly at http://bubl.ac.uk/ . 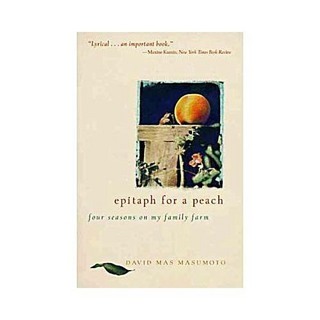 “As pleasurable as a perfect peach, Epitaph for a Peach tells the passionate story of one farmer’s attempt to rescue one of the last truly sweet and juicy fruits from becoming obsolete in a world that increasingly values commerciality over quality. The story of Mas Masumoto’s Sun Crest peaches begins on the day he turns the bulldozers away from his orchards and vows to give himself four seasons to find a home for the fruits of his labor. Last year the Dublin Heritage Center co-sponsored Dublin Reads when we read Snow Mountain Passage. We were not necessarily thinking the Heritage Center would want to co-sponsor with us this year, since our selection is not historical. However, this week I was having a conversation with Elizabeth Isles, the Director of the Center and I mentioned that we were doing Epitaph for a Peach. Well, it turns out the Heritage Museum is going to have a new exhibit coming this Fall on farm life! Farm Life: a Century of Change for Farm Families and Their Neighbors is a traveling exhibit from the National Endowment for the Humanities, Mid-America Arts Alliance. As we talked, Elizabeth and I realized this exhibit connects beautifully with Epitaph for a Peach! For the library’s part we will offer again free drop-in book discussions, a showing of the film The Real Dirt on Farmer John , and we are currently searching for a speaker who can come and talk to us about our food….where it comes from, eating locally grown foods, what is community supported agriculture and related topics. We hope also to offer a visit with the author. The Dublin Friends of the Library will underwrite this special event by providing multiple copies of the book, sponsoring our programs and contributing to book discussion groups. Elizabeth is planning a fabulous array of programs at the Heritage Center to coincide with the exhibit. More details on events will be forthcoming! Dublin Reads will kick off at Day on the Glen, September 20 & 21st and continue until October 31st.